The experiment has been recently moved to the new research group of Prof. Artur Widera in the Technische Universität Kaiserslautern. 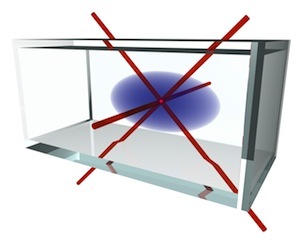 Artist's view of the experimental setup: In an ultra-high vacuum glass cell a single Cesium atom (red) is cooled and trapped by laser beams and immersed into an ultracold Rubidium cloud (blue). to create and control single impurities in a quantum gas, relevant for simulations of polaron-like quasi-particles known from solid state physics.